Pattaya has been paradise for local and foreign men. If you are looking for a night of fun and entertainment, then Pattaya should be the right place for you. It also houses the biggest LGBT scene in Thailand. 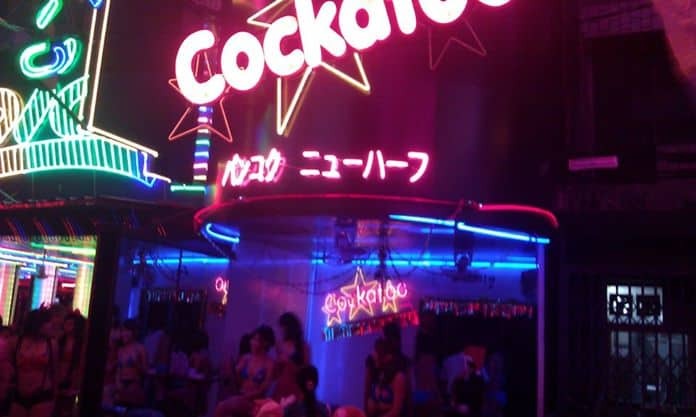 The place also caters to ladyboy-hunting tourists because of the number of bars mostly ladyboy go go bars. If you want to meet ladyboys in Pattaya discreetly, then check out this dating site to get them to come straight to your room. Talking about ladyboy bars, there is one famous ladyboy bar called Sensations. Sensations bar Pattaya is located in Soi 21 just by Soi Buakhao. They have recently moved into a new location coming from Action Street last November 2015. There are several ladyboy bars sprawled along the streets of Pattaya. This makes it quite difficult to choose which one to go to and hang out. But what makes Sensations bar Pattaya stand out among the crowd? It somehow made me interested why this has become one of the famous bars in Pattaya. Thought I’d give it a little visit. Just a little bit of a background, Sensations bar Pattaya is owned and operated by this Brit guy Scot with her ladyboy girlfriend Paeng. Scot has already been famous because he starred in a Sky Living Documentary about ladyboys which was aired back in 2013. Sensations bar Pattaya is not too hard to find. Despite of the numerous bars alongside Sensations, you can clearly see it by its bright red billboard sign. As you enter the bar, you can be able to see that there are ladyboys waiting for clients or patrons. The place is large enough which is good especially if you feel like dancing. There will be enough space for guests to strut their moves. Also if you don’t feel like dancing, there is a large billiard table for your entertainment purposes. This is a good place for you to relax, unwind and have great fun. If you are interested with hooking up with a ladyboy, Sensations bar Pattaya has a lot of ladyboys to offer. They house different talents. Beauty is subjective but I believe anyone of them can fit according to your preference. If you are worried about the heat, the bar is an air conditioned establishment so you won’t have to worry about breaking a sweat. But if you want some fresh air, it is also an open beer bar so there is no problem. It also has 6 guest rooms for rent which was recently opened. This would be convenient for anyone who would like to hook up with a ladyboy for a short time. There is no reason for them to go further so you can just go back and party or perhaps hook up with another ladyboy one after the other. Any establishment has got its advantages and disadvantages. There is no perfect place. If you are not too fussy, then Sensations bar Pattaya could be a great place for you. People or farangs particularly like this place because they throw great parties. Anyone would want to join a great party because it would a fun night to remember. With all the beautiful ladyboys lined up waiting for you, I guess it would be a great bet. As with any good party, it could also be rowdy. There are other bars such as Lita bar that seems to be tranquil or quiet. I guess rowdy is a double-edged sword. It means fun and it also means trouble. There was one night, where two farangs got into a fight because of a ladyboy. That is not something unusual here in Pattaya. To sum it up, all Pattaya ladyboy go go bars are just quite the same. I guess the experience that you had while you were there will either give you good memories or it will just make you want to not return. When I visited Sensations bar Pattaya, for my own research purposes, it was okay for me. The ladyboys, truth be told, are classy and elegant. They aren’t as aggressive compared to any other ladyboy bars where you are pressured to buy them a drink or something. Beers are fairly priced just like with any other bars nearby. The same for ladies drinks which costs about 100 – 130 baht. The atmosphere was very friendly but the location is placed along a busy street. If you plan to stay discreet, then this place is not for you. There are also loyal foreign customers who visits and have a drink every time they visit Pattaya. I don’t know why but perhaps they find that the service is good or better even. Looking for ladyboys in Pattaya? Sensations bar Pattaya is one good place for you if you are looking to hang out with a ladyboy. You can choose from getting one from a go go bar, beer bar (but would usually cost expensive because you would have to buy her a drink, pay for the bar fine, pay for a room and pay for her service). If you don’t have the budget, you can also go to massage parlors. There are ladyboys that offers happy ending massage. You can only spend about 1 hour maximum with the ladyboy and rates depend on the service provided. There are also ladyboy freelancers which you can find strolling along Pattaya Soi 6, Walking Street or Soi Buakhao which costs about 1,000 baht. But you would have to either take her to your hotel room or rent a short time room but these types of accommodations are not easily missed because Pattaya has lots of them. They will cater to the tourists needs. Rooms are usually between 600 to 650 baht. But if you would prefer to have it at your own convenience, you can arrange your own date with just a touch of a button. There are online dating sites such as this one which can offer you a wide range of profiles. They are easy to filter for your easy search. You can choose from women to ladyboys. It is up to you really, just look at their profiles and you can be able to search for ladyboys from there. i am coming to pattaya in september, love to see this place. cant wait really. will i be welcome at your bar? It’s not my bar but if you have money I’m sure they will welcome you. Was at Sensations Last Night Traveled From Australia to see what all the fuss was about heard lots great things Also watched all Documentaries on Nat Geo Was looking forward to being there and seeing it in Person !!! WHAT A LET DOWN !! Bar was small nothing like Tv Paeng was none talking and Rude even after she was told Some in Thai some people had come to meet them !!! NEVER GO AGAIN !! MANY BETTER PLACES ! It was a letdown for me simply because of false advertising. Was looking forward to some time with Paeng. Shes on the website and advertised as one of the girls but when i got there im told shes the boss. No bar fine. Ok thats fine but there were clearly no alternatives. No point if the hottest girl in the bar is on the menu as a tease.